Don't you just love the holidays? Presents! I think it's as fun to give 'em as it is to get 'em. Especially when you make stuff yourself — including the wrapping! 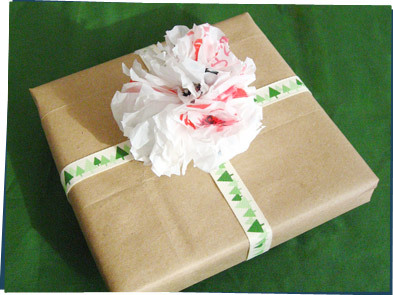 Recycled wrapping paper: Use a paper bag to wrap your present. Brown can look really nice (so earthy! ), especially when you decorate it with stamps or drawings. Reusable ribbon: Use some fabric strips or cloth ribbon to tie up your package. And don't let the other person throw it out — cloth is durable and can be used again and again. Plastic bag bow: Make this awesome pompom out of — you guessed it! — a plastic bag! Who would have thought a grocery bag could look pretty enough to sit on top of a present? Follow these instructions to make your own! What other eco-friendly stuff are you doing this holiday season? Tell us about it!